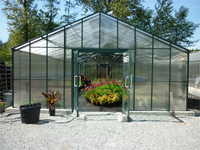 - Five wall polycarbonate greenhouse kits have straight eaves, traditional style greenhouse. Great for your hobby greenhouse, garden greenhouse or commercial greenhouses. Available in the Traditional Series or the Cape Cod Series.